Tyrus Capital launched its flagship fund, the Tyrus Capital Event Fund, in October 2009, barely a year after the collapse of Lehman Brothers caused a global financial crisis. Against this backdrop it seemed a daunting task to be starting a new fund, but Tyrus Capital surprised many observers by catapulting assets to $1.5 billion in just three months. This success was partly ascribed to receding risk aversion as markets were regaining composure, and investors too were emboldened enough to resume allocations – particularly to a fund with a cohesive team that had worked together for many years. Yet what attracted most attention was that Tyrus Capital’s founder, Tony Chedraoui, had in 2008 demonstrated his versatility by generating a return of more than 15% for investors in the Deephaven European Event Fund. Moreover this was attained whilst staying liquid: Chedraoui managed the Deephaven fund from its inception in June 2007 until the fund returned capital to investors – without delays, suspensions, gates, or side pockets – in February 2009. Chedraoui attributes this strong performance, and the low downside volatility that he has continued to provide at Tyrus Capital, to his investment philosophy, seeking to limit the downside in each trade idea, while creating optionality to make money. Born in the Lebanon, Chedraoui was raised in a country wracked by civil war, and grew up striving to create a better life for his family. At an early age his grandfather instilled in him an ambition to attend the Hautes Etudes Commerciales (HEC) in Paris, one of the prestigious French “Grandes Ecoles”. However for his Bachelors degree, Chedraoui decided to study locally, reading computer engineering at the American University of Beirut. It was in 1997 that he achieved his childhood dream when he was one of a handful of Lebanese students to be admitted to the HEC. Following internships in strategic consulting, financial consulting and venture capital, Chedraoui had been set upon a career in the last of these when a friend invited him to a presentation by Lehman Brothers. Inspired by the speaker, an investment banker named Makram Azar, Chedraoui was instantly single-minded about wanting to join Lehman, and if possible work for Azar. Again, this ambition was realised when Chedraoui joined Lehman’s Media and Telecoms team in London a year later. Chedraoui was highly regarded within the group, achieving rapid promotion, but he often found himself wondering why the market was sometimes slow to react to the benefits and synergies of announced transformational deals. He read books about markets, traders and investment strategies, and resolved to see if he could apply investment banking knowledge and skills to an event-driven investment strategy, yet he loved Lehman so much that he was loth to leave. Fortunately, a solution was found in which Chedraoui made his first step into the buy side at Lehman. 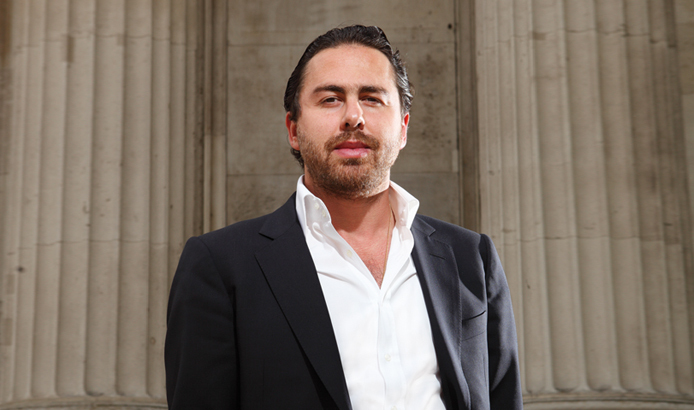 He moved from investment banking to Lehman’s London-based proprietary trading team, and this allowed him to synthesise his experience in investment banking with arbitrage and trading techniques. Chedraoui found that he could indeed generate returns by taking positions in companies where announced deals created value from synergies or from realignments of their businesses, but he was also quick to appreciate the importance of using external legal counsel to advise on deal milestones and timelines, as well as on anti-trust issues. One of the lawyers that he consulted, Xavier Freixes, who at the time was a partner in one of Spain’s leading law firms, particularly impressed Chedraoui with the quality and practicality of the advice he gave. This emphasis on legal analysis meant that Chedraoui only felt comfortable taking positions in companies domiciled in countries where corporate law, especially takeover law, was clear and robust, and where there were plenty of precedents to analyse. Chedraoui continued to hone and refine his investment philosophy, looking for trades where he could pre-define a known and limited downside, combined with a chance to make a profit if his thesis played out. He said that “analysing motivations of the participants in a deal is vital when trying to assess the likelihood that a particular deal will close”, and identified that the over-crowding in many arbitrage situations led to significant downside correlation in trades “du jour” favoured by event-driven managers, especially when markets turned down. He therefore felt strongly that an event-driven strategy should be true to its name and correlated to the deals that it was exposed to, rather than to markets in general, and tried to construct portfolios where he could control correlation not only with markets but also among positions. If some managers view increasing diversification and reducing position sizes as a way to cut correlations, this was never Chedraoui’s approach. Perhaps paradoxically, he argues that “a concentrated portfolio of ideas that share little in common with one another is the best way to minimise correlation to equities”. In the summer of 2006, Chedraoui was approached by Deephaven Capital Management, a Minneapolis-based multi-strategy hedge fund which was searching for a new head of European event-driven investing. Chedraoui spotted the opportunity to build his own team and was finally convinced to join. 2006 was a busy year for event-driven managers, with frenzied deal activity taking place on a global basis. Chedraoui started in his new role that August and within a few months his contribution to Deephaven’s results had attracted enough interest from investors to warrant giving Chedraoui his own fund to run: the Deephaven European Event Fund was born in June 2007. Chedraoui had continued to use the advice of Xavier Freixes, and at this point he persuaded the Barcelona-based lawyer to move his family to London and to join his team at Deephaven. Soon after the launch of his new fund, Chedraoui began to feel more cautious about the outlook for global markets and began curtailing his exposure to long-biased value situations. As markets started to falter in the last quarter of 2007, he grew increasingly fearful that some of the gargantuan leveraged buy-outs that were then being attempted, such as those involving Clear Channel Communications, Bell Canada and Rohm and Haas, rested on precarious foundations. It was clear to him that “the motivation of the participants in these deals, most obviously the private equity buyers and the banks providing the finance, had changed,” and that if they could devise ways to renege on, break or re-price the deals without exposing themselves to litigation, they would. He therefore focused his energies on trying to identify situations, particularly in Europe, where, he says, “the regulatory and legal environment made it harder for deals to break”, and he also sought ways to “short and profit from deals that looked particularly vulnerable”. This approach helped Chedraoui not only to weather the storm, but to generate a mid-teens return for his investors in 2008. The sale of Deephaven to Stark in the first quarter of 2009 gave him the opportunity to step out on his own with the benefit of a strong track record and an established team comprising not just his analysts and traders, but also the individuals who had provided operational support, IT, finance, compliance, HR and investor relations to him at Deephaven. At Tyrus Capital, Chedraoui continued to build out his investment team based on his consistent conviction that “investment banking skills offer a critical advantage when analysing announced deals”. He therefore hired people that he had known for a long time who had worked in investment banking, and most of whom also had experience of working in well established event-driven hedge funds. In keeping with his focus on legal analysis and determination to build a robust compliance framework, he added further lawyers to both the business and investment teams, and Tyrus Capital now counts no fewer than six lawyers among its 28 staff. The operational platform that has been built by Tyrus Capital COO, Mark Madden, has really caught the eye of operational due diligence experts. Madden and his team set out from launch with the determination to deliver an infrastructure which can not only give the investment team all the relevant capabilities that they need, but that can also be robust enough to survive almost any realistic business continuity event. The team used its intellectual capital to build proprietary systems around the traditional vendor portfolio management systems to provide automated reconciliation tools. These create alerts enabling Madden’s operations team to focus immediately on exceptions, trade breaks and operational risks in real time, while screen-based dashboards give him and his team the transparency they need to monitor every relevant aspect of the business, including the IT and operational infrastructure. 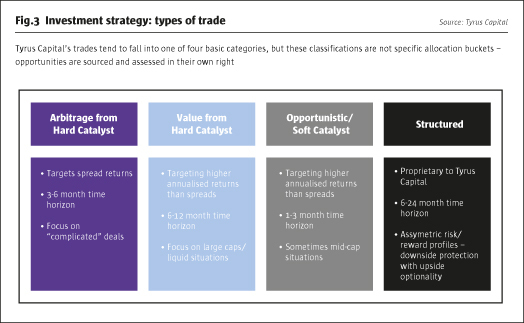 The first of these, arbitrage from hard catalysts, includes not just traditional merger arbitrage, but also capital structure arbitrage, shareholder election arbitrage and other arbitrage techniques, and can be expressed in takeovers, demergers and spin-outs, restructurings and refinancings, rights issues, tender offers and Dutch auctions. Chedraoui sees merger arbitrage as “an inherently unattractive investment strategy because the risk/reward profile of small but limited upside and larger potential downside can lead to significant and correlated volatility across positions if markets turn fearful”. Synchronised sell-offs of popular positions can be intensified if spreads are tight and require leverage to generate a worthwhile return, so he tends only to favour the strategy when spreads are wide and hefeels that the rewards justify the risks. 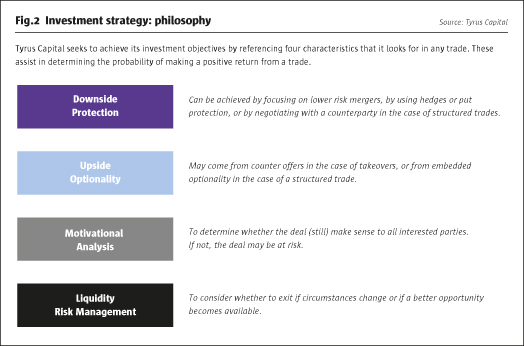 Otherwise he generally has limited exposure to pure merger arbitrage unless a deal has “embedded complexity which makes the spread more interesting, or where there is a genuine chance of a higher counter bid”. Chedraoui and his team will analyse every aspect of a deal and its associated timeline before taking a position, and may even trade in and out of a position during the life of the deal to take advantage of spread volatility around specific milestones. But it is some of the other arbitrage strategies that have provided the most interesting returns for his investors and which most excite Chedraoui when he talks about them. The second bucket encompasses what Chedraoui describes as “value from hard catalyst” and harks back to his days as an investment banker at Lehman. Here he looks for deals which create value for shareholders, and where investment banking skills such as pro forma analysis and valuation techniques enable him and his team to identify situations where an event may trigger significant outperformance of a market over a period of time. Convinced that equity markets are far from efficient, Chedraoui believes that “post-event synergies can be overlooked as event-driven investors tend to lose interest in a deal once it has been completed, whereas long-only investors tend to wait until sell-side analysts can produce research reports post-completion so they can see the synergies and valuation comparisons clearly”. This type of trade requires a “stock-pickers’ market” that rewards fundamental research, and so Chedraoui gets uncomfortable with this type of exposure if he feels that markets are beginning to be driven by macroeconomic factors indiscriminately increasing correlations among stocks. Consequently “we cut our value exposure rapidly at the end of 2007 and again in April 2011,” he says. To maintain this flexibility he likes to stick to situations where liquidity permits him to stay nimble and swiftly exit positions when he wishes to. The next bucket, soft catalyst and opportunistic, includes value positions which have to be smaller because of their more restricted liquidity; Chedraoui recalls “the ability to liquidate the Deephaven portfolio in a couple of weeks in January 2009 was an important factor for my day one investors in Tyrus Capital”. Soft catalysts can also include positions in stocks that have been affected by significant business issues, rather than announced deals. Some of these positions may be short-term and trading-oriented, while others are regarded more as options and can be held for a number of months. The final bucket consists of what Chedraoui refers to as structured trades, and he believes “these set Tyrus Capital apart from many other event-driven specialists”. These positions tend to be highly idiosyncratic, to have asymmetric risk/reward profiles and are often the largest and most complex positions in the portfolios. As they may take months of analysis and negotiation and rely heavily both on the internal legal resource and on external counsel, Chedraoui expects to complete only three or four a year, but it is these trades which have produced some of his most interesting stories and returns. Chedraoui speaks passionately about the structured trades that he currently has in the portfolio as he believes that they offer “upside optionality to a better Europe, while limiting downside risks if macroeconomic fears resurface”. He cites the fact that although the US equity market indices are up almost 20% year to date, the Eurostoxx is languishing scarcely higherthan the level at which it began the year. In particular he has sought to capture upside optionality from anomalously priced companies that boast a global franchise, but are tarred with a peripheral European valuation. Chedraoui continues to believe that the beauty of event-driven investing lies in the analysis of timelines, and he freely admits that a genuine event-driven strategy will only make very high returns when there is a lot of deal activity. “This strategy should correlate to events, and not the market,” he says. It is therefore with considerable optimism that Chedraoui speaks about the rest of the year. The combination of the convexity of his structured trades, together with a noticeable recent pick-up in deal activity and growing evidence of a European recovery, lead him to believe that this could be “the best year for event-driven investing since I established Tyrus Capital almost four years ago”.